How often should we see our dentist? A dental visit should be normally scheduled twice a year, that is, every six months, unless there is on emergency. Why are my gums bleeding during teeth brushing? Sometimes when we brush our teeth or use dental floss our gums start bleeding. This may be a sign of gingivitis; a mild gum disease. However, if you do not cure it, gingivitis may develop into something more serious, such as periodontitis. As long as you notice something wrong you should plan a visit to your dentist, follow the recommended treatment. Teeth sensitivity to cold or hot? Teeth sensitivity to cold or hot is a common problem. This could simply mean sensitive teeth or a more severe oral condition. Dentists are the most suitable people to advice us. So, if you notice any discomfort symptoms, schedule an appointment to your dentist. I am pregnant should I go to the dentist? Unfortunately, a common mistake is that pregnant women neglect or avoid dental visit before or during pregnancy. The so-called pregnancy gingivitis is a common phenomenon but if you do not treat it properly will lead to more serious problems. During this period many hormonal changes occur in your body while consumption of sweets and snacks often increases. As a result, problems which might have existed before pregnancy will become more severe due to the hormonal changes and the increase of mouth bacteria. Additionally, vomit throughout the 1st semester of pregnancy produces an acidic environment in the mouth which has negative results on the teeth. If you are already pregnant or plan to become pregnant, schedule a visit to your dentist. S/he will reassure you and give you the proper instructions so as to enjoy this beautiful period of your life. Fluoride treatment is the topical application of fluoride-containing materials by the dentist to prevent dental caries. 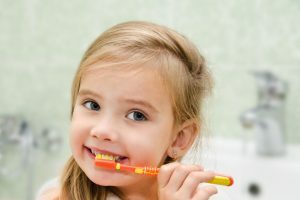 Since children are not very consistent and familiar with tooth brushing plus the consumption of sweets and candies is often limitless a visit to the dentist will help to prevent future problems. We will be pleased to answer to you any question concerning your oral health!